About: The Wellington is a pub famous for their fish and chips. They have a beer garden, a patio, big sport screens showing Sky Sports, fruit machines and background music as well as a selection of ales, beers and spirits. They serve roast dinners on Sundays and cater for vegetarians. Catering for private parties of up to 100 people is available upon request. Pavement seating is available. The wait was unnecessary, totally ignored by the waiter even though he only had a half full restaurant. The area was a mess, the pub is totally unfriendly for seniors and in the end had to leave the pub because we could not get acknowledged by staff. When we complained on the way out, the supervising manager was upset because we thought her staff member was an ignorant pig and wasn't interested in fixing the poor customer service. I would not recommended this pub to anybody, an absolute waste of time. We walked down the street a couple if doors to a tavern and got the best possible service. 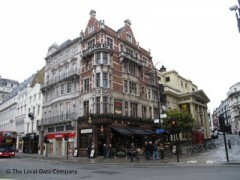 We love this pub, my better half and I always eat and drink here when in London. Great ale and not bad prices for London. They do a great Sunday lunch as well as an ok place to sup a couple of vodka’s prior to the theatre. We have been in The Wellinton twice, last on December 2009. Very good meal, excellent beer and kindly staff. My name is Paco Rodriguez from Catalonia. The staff in this pub are the rudest, most ignorant people I have ever encountered. My second visit, a year after the first, confirmed this. One of them actually swore at me. The food is overpriced for the portions, but if you like fried greasy stuff...They do have good beer, though but it kind sticks in your throat after the death stares of the bar staff.